'For our third instalment of our new Postcards online series, Ebony Bizys (the lass behind some of our favourite craft books, as well as the totemo kawaii blog Hello Sandwich) takes us through her new-found home in Tokyo. Ebony has been living among the hustle and bustle for nearly three years now after moving from the commercial magazine scene in Sydney and has just brought out her new zine, Hello Sandwich Tokyo Guide. 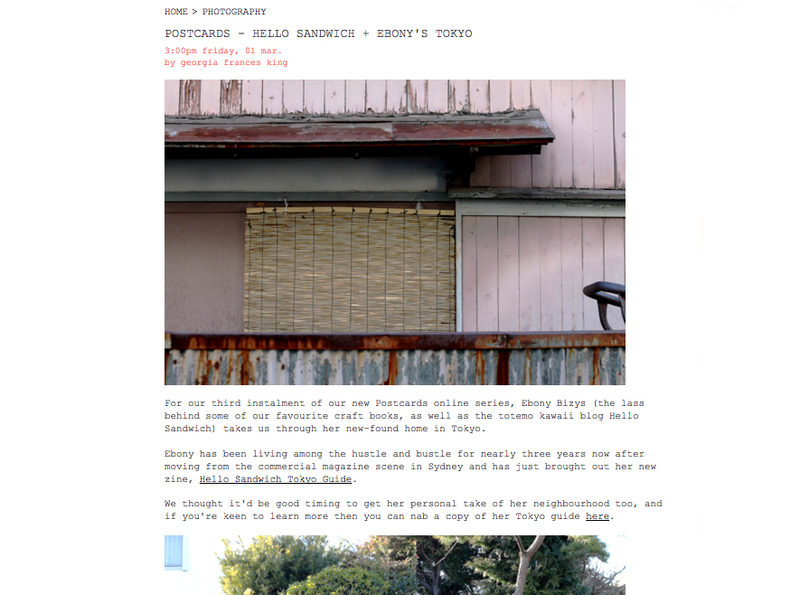 We thought it'd be good timing to get her personal take of her neighbourhood too, and if you're keen to learn more then you can nab a copy of her Tokyo guide here. Firstly please tell me a little bit about the neighbourhood you live in. What does it look like, who lives there, what kind of area is it, etc? I live in Shimokitazawa in Tokyo which is 4 minutes on the train from Shibuya. It's a fun, buzzy neighbourhood dotted with vintage clothing shops, bars, zakka shops, restaurants, record shops, live music venues and lots of cute little laneways. It's a popular area for students so it has a kind of casual feel to it. What do you do in Tokyo? Why did you move there? I make craft books, host regular craft workshops, freelance design and ride my Tiffany's-blue mamachari bike around town taking photos to share on Hello Sandwich. Before I moved to Tokyo in 2010 I had come to Tokyo nine times on holidays. It was getting a bit silly. I really loved my job as Deputy Art Director for VOGUE Living magazine so it was a terribly hard decision to make packing up and moving here, but it was the best decision I've ever made in my life. I am so utterly happy living here. The best advice I came across was to picture yourself having made the decision, 'Okay, I'm moving to Tokyo,' and see how that makes you feel for 1 hour, and then the next time try, 'Okay, I'm staying put in Sydney,' and seeing what emotions come up. Needless to say, Tokyo won over outright! How long have you lived in Tokyo for? How does it compare to where you lived previously? I moved to Tokyo in June 2010 so it's coming up to three years. It is such an incredible city and I am so amazingly inspired living here in Tokyo. Everything is still fresh and inspiring. You'll often see a polka dot truck driving past, school children in matching yellow hats being wheeled to the park in a trolley, staff at the convenience store bowing apologetically when they run out of curry-man... It's these small things that make me smile. It's really sad to watch parts of historic Tokyo being pulled down for renovations. From next month Shimokitazawa Station will be moved underground to make way for a giant freeway to go through Shimokitazawa. I'll miss the fumikiri (train track crossing) dearly, even though sometimes I've had to wait 10 minutes for the crossing to open, which, in winter, can get a little chilly. And just last month my favourite building around the corner from my apartment was torn down because it was too old and an earthquake hazard. Hello Sandwich HQ is a super mini-me apartment. I live here with Mr Y and we share 38 square meters. I've tried to decorate it as best as I can - a few favourites are my confetti system garland, my Beci Orpin folkface cushion, some essentials from Fog Linen and some cheap and cheerful retro furniture from a local second hand furniture shop. Unfortunately, yes, my studio space is here too. Let me just say that with the amount of craft stuff I hoard I've had to get pretty good at cupboard Tetris. I've always wanted to be able to have studio workspace here in Tokyo so perhaps if I get a longer Japan visa extension I can sign a lease for a separate space. What is different to Tokyo than what people expect it to be? When I first started coming to Tokyo on holidays I would stick to the busy shopping areas like Harajuku and Shibuya and I didn't spend time exploring smaller suburbs. Since living here, I've had time to ride my push bike around the backstreets of Tokyo which are so beautiful and very different to the busy areas. Here you can often discover the hidden side of Tokyo - old fish shops, a sweet old lady selling tofu, bento boxes sold by women wearing pink aprons. This is the side of Tokyo I love. I would meet them at 11am at Shimokitazawa station (most shops in Tokyo don't open until 11am) and wander around the shops and cafes in a little. Lunch would be organic Japanese lunch-sets at my favourite little cafe. Then we would ride bikes (bikes are cheap and easy to rent in Tokyo - I know a place that rents bikes for 200 Yen a day! That's cheaper than a coffee!) along Kangdagawa and after about an hour we would reachInokashira koen. We would then wander around the park and Kichijoji's shops before heading into Shibuya to go to my favourite izakaya 'en' for dinner. We would finish off the night in a tiny six-seater bar in 'drink alley' besides Shibuya station. What are some of your favourite places to photograph in Tokyo? Why? I really enjoy shooting the lesser known suburbs of Tokyo. I enjoy the textures, colours and history of these places. Rusty signs, faded pastel amusement parks, Japanese grandmas serving okonomiyaki in floral aprons, that kind of thing. I also can't go past a potted garden without whipping my camera out. Because I was working full time at VOGUE Living when I was living in Sydney, I didn't have much time to work on my own projects. Living in Tokyo and being freelance has enabled me to make zines, produce craft and work on my own book projects. I began being more and more interested in craft after being immersed in the incredible craft scene here in Tokyo. Having instant access to Tokyo's creativity has inspired my work and life in so many wonderful ways. What is the local creative community like? Are there predominant local crafts? There is always a flyer for a cute new exhibition in my letterbox. I've made friends with a few people who own galleries, shops or studios so it's always nice popping to the opening events and seeing some cute new work. I really love the way you can visit an artist's 'exhibition' but you'll also find a table of goods being sold by the artist such as postcards, notebooks, handmade items or even cute cookies. One of my favourite galleries in Tokyo is Nidi Gallery. There is something about the Japanese equivalent of Bunnings that I love. In Japan I've found they often have a traditional Bunnings-style floor with timber and paint (for the boys) and the other floor is all of the homewares, furniture, craft (for the ladies). Think patterned foil wrap, various different types of astroturf tiles, polka dot tea pots, bento box accessories... I even go nuts for the cute packaging of Japanese cleaning products. Yoyogi koen is only a ten minute bike ride from my apartment and is such a vast park with various different sections, so you can always find a nice spot to park your picnic rug. I also really love Inokashira koen with its pretty pond filled with swan boats. Be warmed though, it's not advised to go on the swan boats with your boyfriend or girlfriend as the belief is that you will soon break up. I love the bars around Shimokitazawa. Friendly, cheap and cheerful (and best of all, I can walk home!) All of my favourite bars and restaurants are listed in my new Hello Sandwich Tokyo Guide Zine.